You can’t see what’s inside those packets and tins, so you plump for the yummy-looking picture on the box. Yet obviously you’re not actually going to eat the box, so is it worth buying the most expensive brands just because you like what’s on the outside? While the packaging on the supermarkets’ own ranges don’t look great compared with the brand-name equivalent, you could be paying twice the price when you can’t even taste the difference. 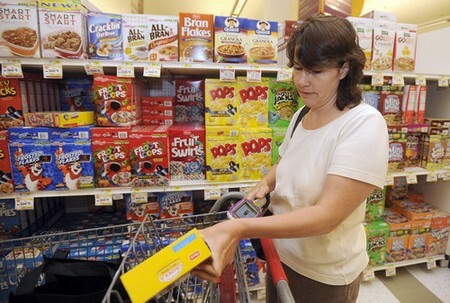 Try swapping your usual brand of beans, coffee, cereal or what­ever for the next cheapest one. If you don’t notice the difference, stick with it. If you do, switch back to your usual brand. Turn it into a game and each week choose five items you can down­grade on; start with storecupboard staples such as spaghetti, rice, chopped tomatoes, kidney beans or tinned sweetcorn -don’t tell your family and see if they notice. In some cases you’ll hate the cheaper version, but with others you won’t notice any difference in taste, so they are well worth buying and saving yourself some money. Supermarkets put their most expensive products at eye level as they’re easier to spot. So if you’re after those cheaper brands, look down – they’ll be on the lower shelves, and the no frills and value ranges are usually hidden away on the shelves at the very bottom. Supermarket layouts are pretty similar and well thought out. And that infuriating habit they have of moving everything around just when you knew where it was? Well, that’s deliber­ate so you’ll spend more time browsing rather than dashing in and out. You’ll find basics such as fruit and veg, meat, fish, bread and dairy products round the outside of the store, but all spaced out. Then you’ve got the buns, biscuits and all those tempting good­ies slap-bang in the middle. What the supermarket’s banking on is you walking through the middle, or at least up and down the aisles, randomly filling your trolley. So to beat them at their own game, stick to the edges for the essentials. This is when you’ll find all the reduced food that’s got to be sold that day. For the best deals, go on a Sunday just before closing, or on weeknight evenings. Check the bargain bins for fish, meat, fruit and veg and ready-meals. Even if you can’t use them that day you can freeze them for a meal next week. It sounds obvious, but shop when you’re hungry and you’re more likely to spend more. The reason being we get lured into impulse buys rather than just getting the basics that were on our list.